A particular care is brought to the common parts of the residencial. 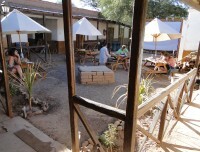 In the patio, several tables are at your disposal to discuss or eat. Around the patio, roses, geranias and palm trees bring their touches of colors. 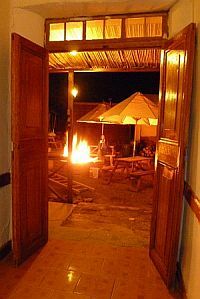 In the middle of this place, a "fugon" will spread warm and conviviality during your evenings spent at La Rose d'Atacama. Some solar energies lamps will make echos for the starry sky of the Atacama's nights. Fig tree, pomegranate tree and quince tree will assure the shade of your readings or your naps in the hammocks of the garden. The garden is irrigated by the water services of San Pedro de Atacama every 15 days, as it is made in all the city districts. A surprising and instructive moment about the functioning of canals and the management of water in the desert which you will maybe be privileged to observe during your stay. La Rose d'Atacama is a partner of the program led by Rosa Vilca and financed by Minera Escondida for the waste recycling in San Pedro de Atacama.